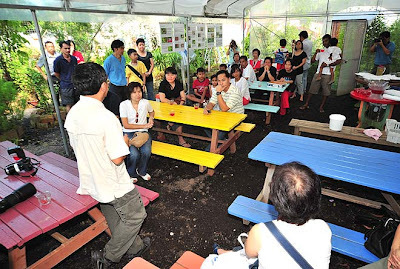 Singapore's 43rd National Day also saw the Soft Launch of the new Butterfly Lodge at a private farm in Sembawang. Over the past 6 months, this project to create an educational and butterfly appreciation facility was in progress. 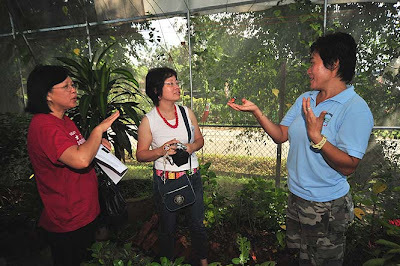 Oh' Farms at Sembawang conducts educational tours of its facilities on hydroponic farming, horticulture and medicinal and herb gardens for primary school children. 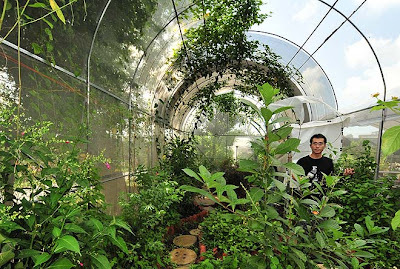 As part of its mission of sharing and educating Singapore's younger generation, it decided to invest in creating a small butterfly aviary to spread the message of butterfly appreciation and conservation. 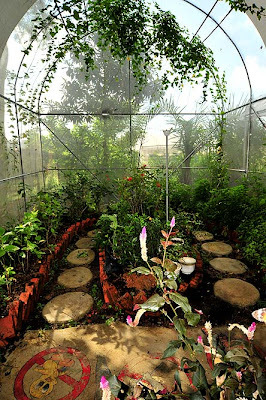 The project started with the planning of a simple flight cage, and with the advice from the experienced members of ButterflyCircle, the construction and landscaping of the Butterfly Lodge took shape. The simple flight cage took the form of a barrel-vaulted roof form, as it had been observed at various such similar facilities where a standard rectilinear shaped cage created corners into which butterflies flew and got themselves stuck and damaged their wings. 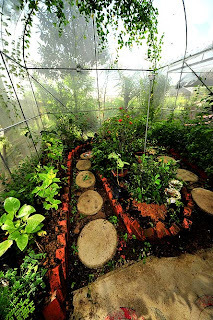 Appropriate butterfly nectaring and host plants were sought from various sources, and planted into the flight cage. 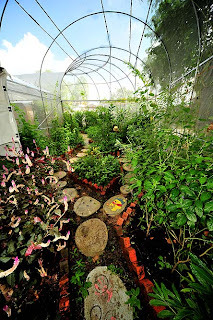 With Oh' Farms' horticultural expertise, the plants were well-tended and grew lush and healthy in a very short time. Other "filler" plants were included to create a humid and lush landscaped area, conducive for the butterflies' survival and well-being. 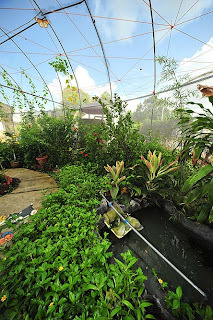 A pond, as well as water-misters were also added to ensure that the plants are well-watered and kept healthy, and to create as natural an environment as possible for the butterflies. 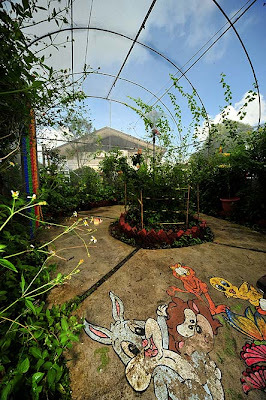 Plans were then put in place on how school children visitors would be actively engaged as well as learn about ecology, nature conservation and the sustainability of butterflies as part of the fauna of Singapore. Information boards were designed and put up as an educational backdrop for the school children before they are shown into the Butterfly Lodge so that as little damage as possible would be done to the environment as well as the butterflies. Information worksheets were also designed to keep the children interactively engaged and to take away important information about butterflies. As the target audience would be primary school children, colourful graphics were also added to lend a touch of fun and cheer to the facility. 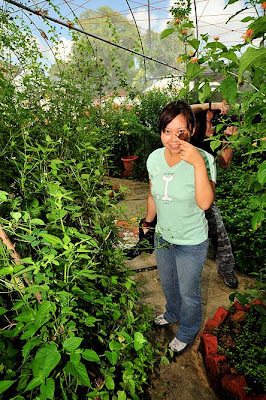 On 9 Aug 2008, a group of school teachers and principals from various schools in Singapore were invited to a showround of the Butterfly Lodge. Most of these teachers, already strong champions of environmental and ecological conservation in their respective schools came to see and learn about how they can create more awareness about butterfly conservation in their schools. The session started with a short introduction of the facilities by Yeok Keong, the owner of the facility. ButterflyCircle members did an introduction of how the butterflies and plants can be sustained in a controlled environment, and how to take care of the butterflies. 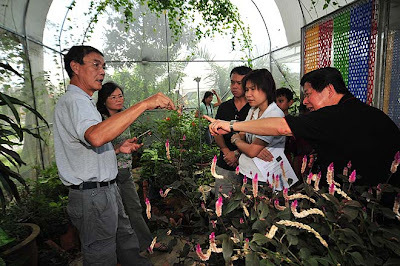 The project also featured an opportunity to observe and learn about butterflies and their conservation in Singapore. Members also showed the invited guests in the flight cage, and how to gently handle the butterflies which had just eclosed. The project has started successfully, and the sustainability of the breeding of common urban species has been encouraging. Due to the need to maintain the host plant-caterpillar balance, adult butterflies are also released to the external natural environment so as to ensure that the host plant supplies do not run out due to the high population of caterpillars of certain species. In a controlled environment where predators are absent, the survival rates of the caterpillars are much higher than in a natural environment, hence the need to find a good balance as well as allowing some proportion of the bred stock to fly free back into their natural environment as a conservation initiative. 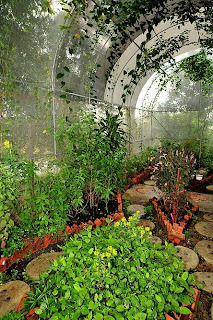 Whilst a flight cage is not always the ideal "home" for butterflies, a well-managed facility will serve a critical function in the education and research into butterflies. In the case of Butterfly Lodge, all the species are locally found, and none are imported from beyond Singapore's shores. 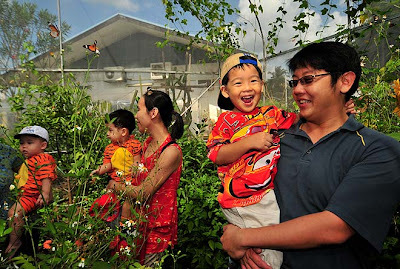 This is unlike many butterfly parks/farms around, where stock is imported from neighbouring countries or further afield. 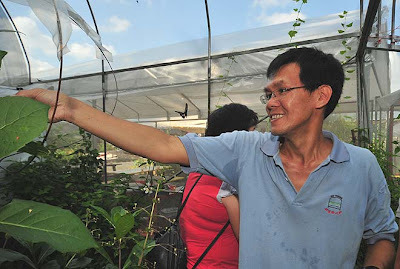 The lessons learnt and experience gained from observing and nurturing local species of butterflies will go a long way in accumulating further knowledge for the creation of more free-ranging trails like the one at Alexandra Hospital and Butterfly Hill at Pulau Ubin where landscaping and horticulture are designed together with ecological conservation of butterflies in mind. As the Butterfly Lodge is located on private premises, the educational tours for school children are upon special arrangement with the respective schools, in the form of organised outdoor classroom sessions. 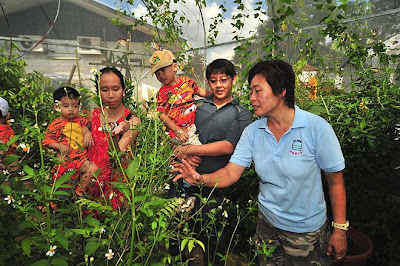 The information is packaged for primary school children at an appropriate level and the children will take away lessons and mementoes of their visit to the Butterfly Lodge - with better appreciation and respect for our Flying Jewels in Singapore. As for ButterflyCircle members, the satisfaction of being able to share our knowledge, photos and spread the conservation message is the acknowledgment that we are thankful for. As part of the voluntary community service, we are proud to be involved in the education of young Singaporeans in the field of environmental sustainability, and butterfly appreciation in particular.